Window Rock Airport (ICAO: KRQE, FAA LID: RQE, formerly P34) is a public use airport located 1.15 miles (1.00 nmi; 1.85 km) south of the central business district of Window Rock, in Apache County, Arizona, United States. It is owned by the Navajo Nation. 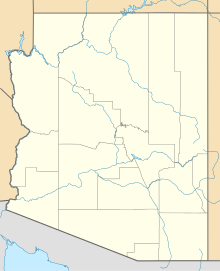 This is one of six airports owned by the Navajo Nation; the other five being Chinle Airport (E91), Kayenta Airport (0V7) and Tuba City Airport (T03) in Arizona, plus Crownpoint Airport (0E8) and Shiprock Airport (5V5) in New Mexico. Although most U.S. airports use the same three-letter location identifier for the FAA and IATA, this airport is assigned RQE by the FAA, but has no designation from the IATA. Prior to December 1998, its FAA identifier was P34. Window Rock Airport covers an area of 88 acres (36 ha) at an elevation of 6,742 feet (2,055 m) above mean sea level. It has one runway designated 2/20 with an asphalt surface measuring 7,000 by 75 feet (2,134 x 23 m). For the 12-month period ending April 14, 2011, the airport had 5,000 general aviation aircraft operations, an average of 13 per day. ^ a b c d FAA Airport Master Record for RQE (Form 5010 PDF). Federal Aviation Administration. Effective 25 August 2011. ^ "Navajo Nation, Air Transportation Department". Archived from the original on 28 September 2007. Retrieved 2 March 2007. ^ "Window Rock, Arizona (ICAO: KRQE, FAA: RQE)". Great Circle Mapper. Retrieved 16 October 2011. ^ "Notice of airport identifier changes". AOPA Online. Retrieved 16 October 2011. This page was last edited on 3 May 2018, at 05:30 (UTC).